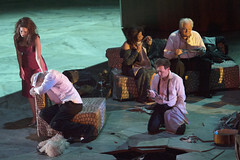 German designer Hildegard Bechtler made her Royal Opera debut in 1997 as set designer for Paul Bunyan. She has since designed sets and costumes for The Royal Opera and The Royal Ballet’s co-production of Dido and Aeneas/Acis and Galatea and The Royal Opera’s The Exterminating Angel. Bechtler was born in Stuttgart and studied painting at Camberwell College of Arts and stage design at Central Saint Martins. She began her career in film before moving into opera and theatre design. 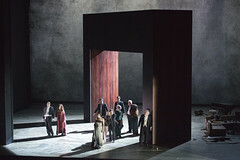 Opera set designs include La Cenerentola and La traviata (Glyndebourne Festival), La Damnation de Faust, Lohengrin and Boris Godunov (English National Opera), Don Carlos, Madama Butterfly and The Makropulos Case (Opera North), Dialogues des Carmélites (Washington National Opera), La finta giardiniera (Santa Fe Opera) and Aida (Canadian Opera Company). Her set and costume designs for opera include Kát’a Kabanová (Boston Lyric Opera). She has also designed for Bavarian State Opera and La Scala, Milan, among others. Bechtler regularly designs for the National Theatre, credits including Waste, A Taste of Honey, After the Dance (Olivier Award for Best Costume Design) and The Merchant of Venice. Further credits include for the Royal Shakespeare Company, Hampstead Theatre, Old Vic, Donmar Warehouse, the Royal Court and Almeida (where her designs include sets for Uncle Vanya and sets and costumes for Oresteia, nominated for the Olivier Award for Best Set Design). Her West End designs include the Olivier Award-winning Top Hat.